What Are the Visible Characteristics of Quality Mussels? Mussels are molluscs with two hinged shells (bivalves) which filter their food from the surrounding water. Mussels can be found attached to gravel, seawall, and rocks in intertidal and subtidal coastal areas. They can survive out of water for an extended period of time if kept in a cold, moist environment. The most commonly marketed species is the Blue Mussel. A healthy mussel whose shell is open should close when gently tapped. If the shell is broken or the meat is dry, the mussel should be discarded. "Beard", clumps of dark threads attached to the shells, are normal and are used to anchor mussels to rocks and other materials. The color of the shell is blue-black but can range from light green to tan depending on species and harvest areas. Shucked mussels should be moist and plump, with a fresh and mild odor. The meat of shucked mussels is usually tan or beige but can range from yellow to deep orange. What Is the Grit-like Material Occasionally Found in Mussel Meat? Occasionally mussels contain small pearls, particles of sand, and shell. Pearls are formed in response to physical and biological irritations. To remove these particles, wash the mussel meats in cold water. Are Mussels Safe to Eat? Mussels harvested from approved waters, handled and processed in sanitary conditions are safe for raw consumption by healthy individuals. Harvesting waters are monitored by states and local jurisdictions. If excessive levels of contaminants are found in the water, commercial harvesting of mussels and other shellfish is prohibited. Recreational fishermen should harvest mussels only from waters that are safe and approved for harvesting. State or local health authorities often issue warnings and closures to advise recreational harvesters. Federal, state, and local officials use the guidelines of the National Shellfish Sanitation Program in regulating the handling, processing and distribution of mussels. These guidelines require product labels and tags to include a certified dealer number. This number indicates the dealer’s firm operates in accordance with the National Shellfish Sanitation Program. How Should Fresh Mussels Be Handled Stored and Cooked? Mussels should be scrubbed with a stiff brush or coarse sponge and rinsed with cold water to remove any debris. Beards can be removed or left attached. Mussels in the shell should be refrigerated between 32o and 45 o F. Store live mussels covered loosely with a clean, damp towel. Do not store mussels in airtight containers, plastic bags or in water. Handle and store raw and cooked mussels separately to avoid cross contamination. Work area and utensils should be thoroughly cleaned. Follow a "use by" date if provided. Use as soon as possible after purchase. 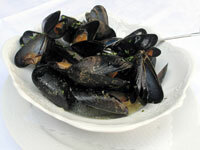 Mussels are generally cooked prior to consumption. When boiling or steaming mussels, use small pots to ensure even cooking. After shells open, boiling should continue for 3 to 5 minutes. Steam 4 to 9 minutes. Mussel meats frozen at home should be stored in a tight container or freezer bags containing the liquid of the mussels. Mussels frozen at home can be stored for as long as three months and should be maintained at 0 o F. Frozen mussels should be thawed in the refrigerator for 24 hours and not be refrozen. Once thawed, the texture of the meat is softer and is most often prepared cooked. What Is the Nutritional Value of Mussels? In a large kettle, sauté onion and garlic in oil. Add tomatoes, tomato paste, lemon, oregano, basil, and black and red pepper. Cover and simmer over low heat for 25 minutes. Add red wine and simmer uncovered 15 to 20 minutes until sauce thickens. Add mussels, cover and cook over medium-high heat 5 to 10 minutes until the mussels open. Serve mussels and sauce over linguine. 8 servings.